This museum is spread over 38000 square metres area and is dedicated to archaeological finds of Jinsha Site. Dating back to about 3,000 years ago, the time from the late Shang Dynasty (17th-11th century BC) to the early Spring and Autumn Period (770 BC-476 BC). It is the core of Shang and Zhou Dynasty (17th century BC-221 BC) and the second ancient city of Shu State was discovered after the Three-Star Piles Museum. There are around 63 sacrificial spots, 6,000 pieces of precious relics, over 70 building spots and 3 centralized cemeteries were discovered in excavation. It has four main parts: Relics Hall, Exhibition Hall, Cultural Heritage Protection Centre and Ecological Garden. 3D movies have extra charges. The entry is free on May 18 (Jinsha Museum Day). The ticket counter closes at 05.30 pm. 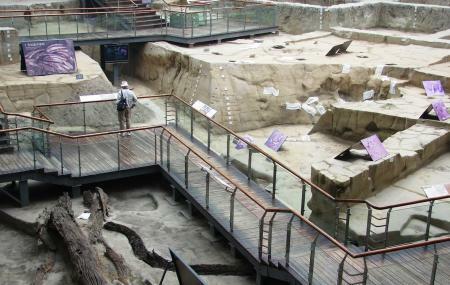 How popular is Jinsha Site Museum? People normally club together Luodai Ancient Town and Kuan-zhai Ancient Street Of Qing Dynasty while planning their visit to Jinsha Site Museum.